If you’ve been frustrated by waiting in a long security line for your international flight — even though you’re signed up for Global Entry or TSA PreCheck — then be thankful that five new airlines have joined the program operated by the U.S. Department of Hapless Security. Travelers on Cathay Pacific, ANA, Korean Air, Finnair, and Contour Aviation (a charter airline based in Tennessee) are joining the program, according to a TSA press release. (HT to Loyalty Traveler) That brings the total list to 42 airlines around the world. One of the biggest benefits will be for travelers departing the U.S. and traveling on one of these airlines. You’ll be able to pick up your boarding pass and whizz through security even faster to spend your time in the departure lounge, rather than in line. Still, not all international terminals have PreCheck partly because of the slower uptake among international carriers. The TSA provides a complete list of participating airlines and airports on its website. The other benefit of having international airlines like Cathay Pacific join PreCheck is that they can collect your known traveler ID and pass that along to any other airlines you’re flying with in the U.S. on a return journey. But if your carrier hasn’t joined yet, you can still get around this hiccup. For example, on past trips with Cathay Pacific, I would clear immigration and then go to the Alaska Airlines ticket counter, ask them to add my known traveler ID, and then ask them to re-print my boarding pass. This required an extra step but was worth the effort. Those who don’t have PreCheck yet should seriously consider enrolling. There are four options. 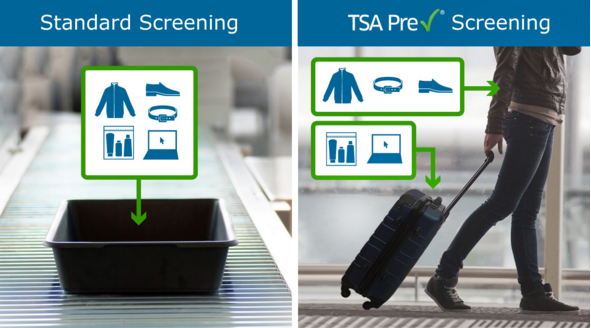 PreCheck is available to most people. It typically costs $85 for five years, although many credit cards, some loyalty programs, and even some employers will cover the cost. Enrollment is quick, too, with stations at airports and in cities. However, it’s only going to help you get through airport security. Global Entry is my preference. It typically costs $100 for five years, and again the cost is covered by some credit cards. You’ll need to enroll through Customs and Border Patrol and submit to an interview, which can delay the process. But it can help you speed through customs when you return from an international trip. Nexus and Sentri are programs for frequent travelers to Canada and Mexico, respectively. They include the benefits of Global Entry and PreCheck, but enrollment is limited to a few specific locations near the border. Depending on your family structure, the cost can be cheaper than Global Entry, too.